First of all, what are the legal requirements? These will vary from country to country, but I’m hoping that most civilised countries have something similar to what we have in the UK - or, indeed, something better! What you use is up to you - but you must use something! Your dog must be restrained while travelling in a car. It’s commonsense, and furthermore, your insurance company may find a loose dog in the car the perfect excuse to refuse to pay out on your policy. This could be very, very expensive. I’ll look at the different types of restraint mentioned here further in this article. I’m not going to compare brands or models, as there’s such variation around the world. For more advice on car protocols for dogs, get our free email course here! Safety first. A loose dog is considered an unrestrained load, and as a projectile could do a lot of damage to driver and passengers in the event of a crash. You need to restrain your dog so that any impact from a collision is minimised. A dog doing pirouettes on the end of a car harness is not a good idea. Your insurers may be happy to negate your insurance if the dog could be presumed to have interfered with car safety. Your dog needs to be able to shelter from direct sunlight, or to keep warm in a cold car. Having a crate you can cover with cloths also prevents the dog seeing out and becoming motion-sick as a result, and may minimise car-barking. A tethered dog would be easy to see in a car, and easy to steal as you’ve obligingly put him on a lead already. Basically - don’t leave a dog tethered. The risk of getting tangled, breaking a leg, or being strangled is too great. When you arrive at your destination, you need to be able to get your dog out of the car in an orderly fashion. So your dog will learn to wait till the lead is fixed to his harness before being allowed to jump out of the car. In the event of an accident, rescuers need to be able to help the people in the car, and the dog too. Not easy with a loose - or tethered - terrified, injured dog. There is also the danger of the dog escaping from the car in an accident. Dogs have been lost for ever this way. Now to the types of restraint you can use. You have to balance safety, convenience, and budget. But will the convenience and the money-saving be worth it if something bad happens? You'll see that all these methods specifically exclude dog-on-lap, dog bouncing from front to back of the car, dog on parcel shelf, dog hanging out of window, and so on. Crates can be removed to free up space when you’re transporting other things - even people, perhaps! Fabric crates - dogs can overheat in these. And your dog must be acclimatised to a fabric crate out of the car first. Not suitable for puppies. You can have a hole to pass the lead through. Tethering anywhere in the car: ensure dog can’t leap out and hang himself. The dog is restrained in one area of the car and can’t interfere with the driver. If the dog is small and the boot large, they have too much space to race and jump about. Nothing to prevent them leaping out into the road as you raise the boot. As you can see, a custom crate is my preferred solution. Yes, they cost money. But so did my dogs. And the amount of love, care, and money that has gone into them since they arrived is massive. So what’s another few bob to keep them safe? But who cares about the money? 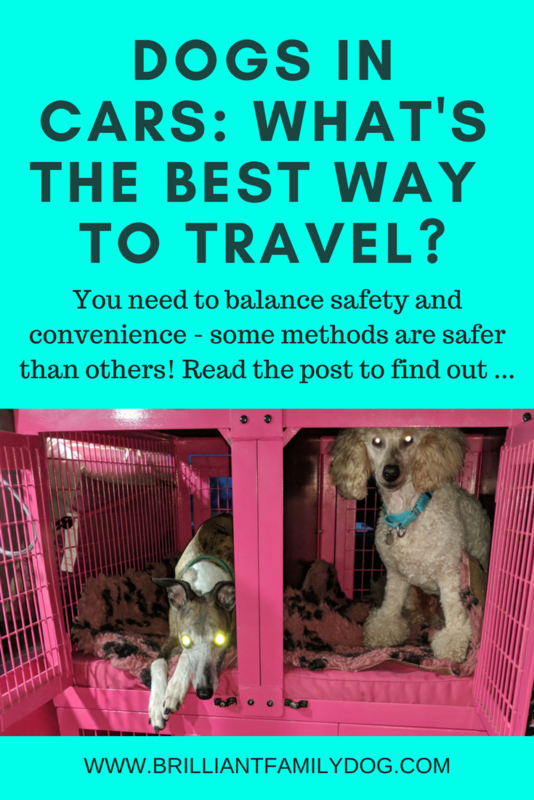 I want my dogs to be as safe as possible when I ask them to travel in my car. I provide approved protection for my human passengers, the least I can do is provide appropriate protection for my precious dogs! How does your reactive dog impact the rest of your doggy family?